(Text automatically translated) The riad Gallia, 10 minutes from the famous Jemaa El Fna square and its animations. The riad Gallia offers a patio of 50 m2 with its blue pool, the kitchen, the dining room open onto the patio, 3 bedrooms all air conditioned and bathroom or shower room, the dining room with its fireplace, bathroom, sun terrace, barbecue terrace and sundeck with views of the Atlas. Enjoy - your support in 4X4 upon arrival at the airport - traditional breakfasts prepared by our cook Saadia (included in rent) - Daily cleaning of the riad done by Saadia, included in price Rental also. In addition, Saadia will make you discover all the flavors of the country: couscous, tagines, on request. Three types of menus are available at the riad (not included in the rent). Lovely and clean, very spacious. Jamal and Saadia were excellent. We had a really lovely time at Riad Gallia, food provided by Saadia was delicious and very easy. Jamal organised us a trip and got us a great taxi driver. The pool water didn’t look 100% clean and the birds that frequented the Riad unfortunately had left a few deposits. Only negative was when we were sitting in the Riad on the second to last day some potential buyers were shown around. We weren’t notified of this and it meant strangers were in the Riad with our personal possessions but also it was awkward because we were there. We thoroughly enjoyed our 3-night stay here. This is a lovely riad, as others have said, and the combination of the hospitality and the location make it an ideal place to stay. Being winter it was a little chilly, but there are heaters in each of the 3 bedrooms. The WiFi works but is not strong. We could just about make a Skype call, but Netflix was challenging. New towels and updated linens would be a worthwhile investment to make this a true 5-star stay. They are ... a little worn. Thank you to Sofia and to Jamal - Sofia is a very responsive owner, and Jamal a tireless host. Sofia, the owner was almost immediate with her response to emails. We arranged for a meal to be home cooked and ready when we arrived and found it on par with anything we had in a restaurant. Special thanks to Jamal who made sure we had everything we neeeded. He found out that the marathon would close the road to the airport and arranged an earlier pick up. Just a real sweet man. The accommodation was really clean, nice and within a short walk to the souks. Only recommendation would be to have some soap, shampoo and have coffee/tea available in kitchen even if we had to pay a small fee for. Riad Gallia is a wonderful home in Marrakech. The riad itself is lovely, and it is perfectly located - close to the central square and in walking distance of everything within the medina. Jamal and Sayeeda really put this riad over the top. They took care of us in every way - cooking, cleaning, laundry, every tiny little errand and maintenance issue; they had great recommendations and found us an incredible tour guide. Try every one of the dinners that Sayeeda makes - each are wonderful. The only thing to be aware of is that, in winter, the riad is quite chilly - though, I am sure that is universal among all riads. All in all, couldn’t have asked for anything better. We have a wonderful stay at this Riad. We were superbly taken care of; from the very beginning at our arrival at the airport to our departure. 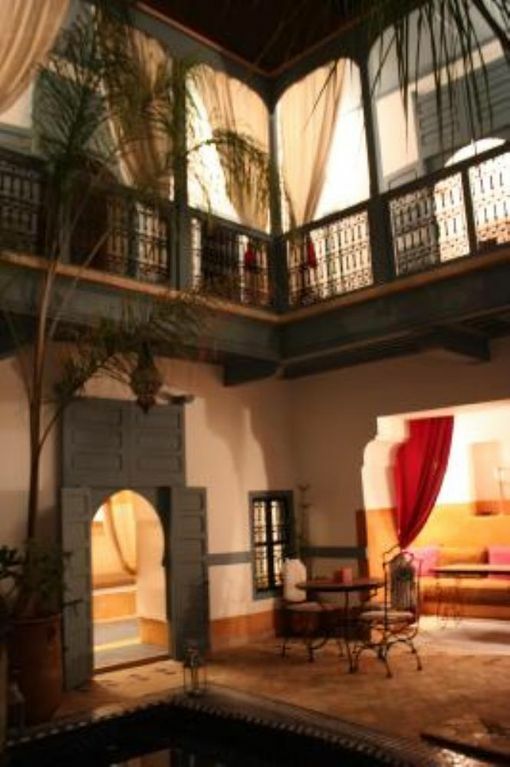 The riad is very quite, comfortable and at a perfect location (just 10 min walk from the main plaza). Highly recommended. The Riad Gallia was better than we expected. Not only is interesting architecturally, but it is generally well-appointed. But, perhaps the best parts are Jamel and Saadia. They treated us as guests, not customers. When I use the term "Hidden Gem" here it is because without Jamel showing us the way, we would never have found it. Even the locals don't know where it is as we found out when we got lost one evening. The riad is a one or two minute walk to the local markets/street vendors and a ten minute walk to the huge square and markets and about the same to enter the maze of the souk. So, it is ideally located for exploring the old city. (Text automatically translated) Ideally located, Riad Gallia is accessible by car at 50 m, 10 minutes walk from Jemaa El Fna square, 15 minutes from the door Golfs BAB Ghemat. (Text automatically translated) Our goalkeeper Djamel responsible for your welcome, also ensures the proper functioning of the riad. Finally, Djamel is not a guide, but may, however, advise you on your excursions. You will also find on site, all the necessary documentation to facilitate your museum visits, excursions and other delights to discover.